If you keep a sketchbook, or maybe several at once, you are keeping a record of things that are in your head, just like a diary. The diary might be an internal monologue of how you are feeling, inward-looking and for your eyes only, or it might be one like a politician or a journalist might keep, their own observations on the world they see. They may be a place to work on your writing, to find your voice, to figure out your thoughts and expand your ideas. Sketchbooks can be very much like that. Sketchbooks can be whatever you want them to be, and for many are a mixture of the two, a sketched journal. I have tried that myself, writing out pages alongside the drawings, but I often have a hard time mixing the two; people can be so differently affected by text than by image. Image is often undermined by the text, which can be a distraction. Text, even open-ended and vague text, sometimes tells the reader what to think about the drawing around it. So I usually reserve my own text for the blog post when it is a step removed from the drawing, and very much a take-it-or-leave-it thing. You can look at my entire website without reading a word and it wouldn’t matter. In fact on my old iteration of my blog from a decade ago, every time I would post a sketch I would shrink the font of the accompanying nonsense writing to about size 8, so not to distract from the sketch itself. Anyway, I thought I would share this thought with you. I think of my own ‘main’ sketchbooks, which are produced very much with the idea that someone would look through them, as visual diaries. I would never let someone read a written diary (not without heavy editing), it gives too much away. (In fact when I was younger and wrote pages and pages in my diary nightly, I wrote in a different alphabet that I invented when I was about 13 or 14; hey you were interested in girls (or boys), well I was interested in alphabets). So my main sketchbooks are ways for me to relax and draw the world that I live in. I do have non-realistic more fantastical drawings too, but I do those elsewhere. 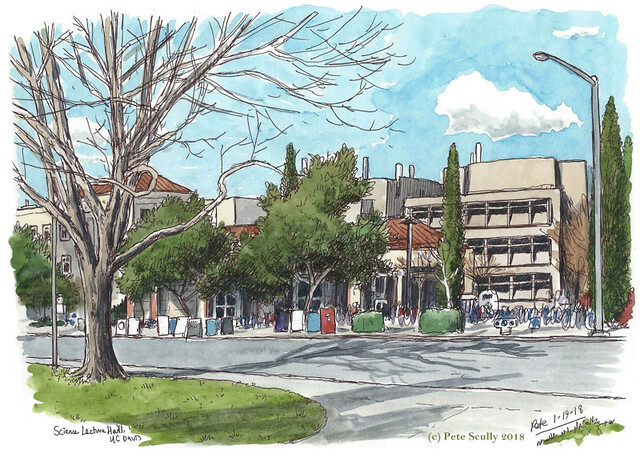 Since I live in Davis, my sketchbook is filled up with images of Davis, and since I work at UC Davis, well I can say that I have a campus in my sketchbook. 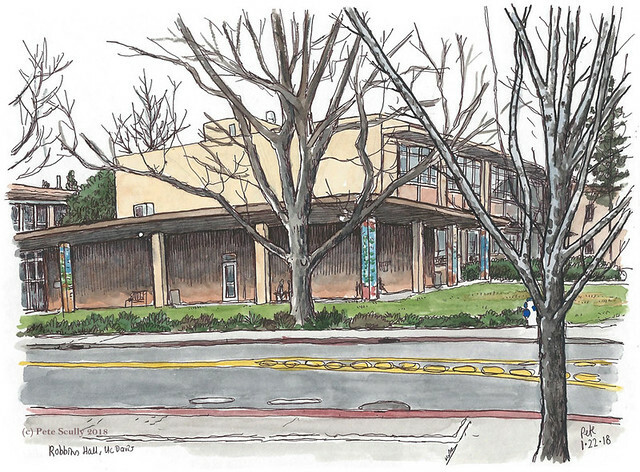 All of which is a way to say, I have just started to catch up on my scanning, so here are four recent (January) sketches from the UC Davis campus. The sketch above (sorry, you need to scroll back up there) is the Science Lecture Theater, or SciLec, which would be a cool space villain name. It’s hidden behind those trees and frat boards. Below though, on a cloudier day, is Robbins Hall. I’m starting to catch up on the buildings I walk past but haven’t yet drawn (yes, there are still a few). 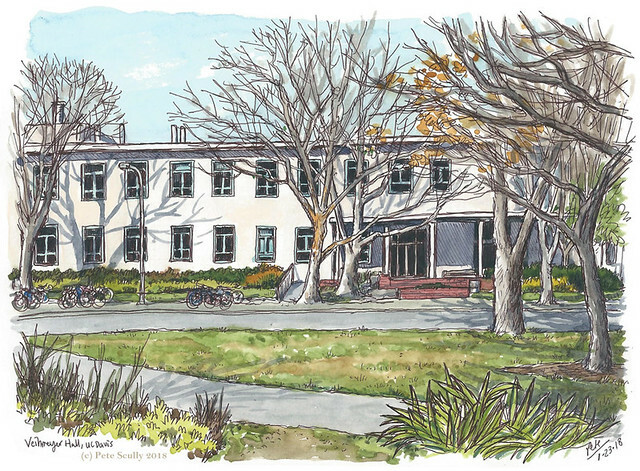 Underneath, sketched after a morning training class, is Veihmeyer Hall. I last drew this almost a decade ago I think it was, I like the way the shadows cross the white building. I sat in a little garden on a bench and sketched this. When January comes, with its bright chill skies, I get excited because I can finally draw the leafless trees, but sometimes they are a bit intimidating (see the ones of the right). I like it when the trunks are not just that bleached brown or grey, but also have patches or orange or green colouring the bark. You cannot get much of a window into my thoughts from looking at the sketches. You can only imagine. I assure you I was probably thinking about soccer (listening to the Totally Football podcast or the Football Weekly podcast), or maybe history, or maybe alphabets. 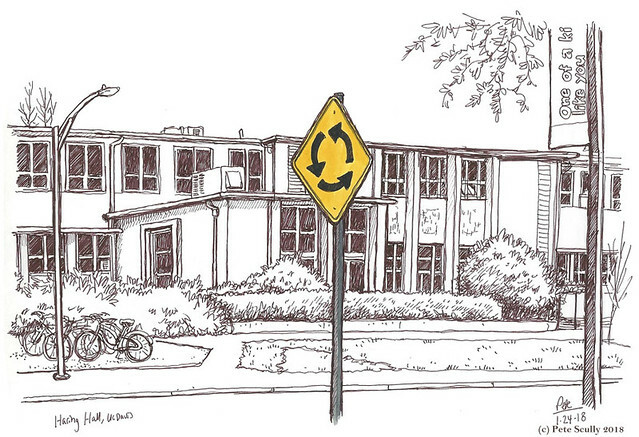 Below is one of Haring Hall, but I kept that uncoloured because I like the big yellow sign. 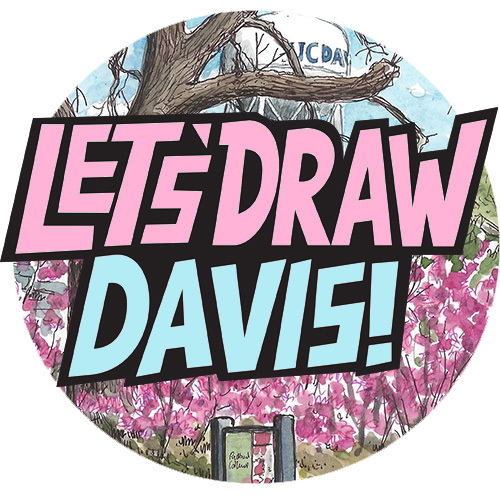 When I first starting drawing Davis in my sketchbooks, I hadn’t been here long and the idea was that I was drawing the world around me to remember it after I had left. Davis, I am still here, and still finding more to draw. Wow! Those are beautiful! I am super inspired!! Fantastic post!! I can’t wait to go out and sketch!! Yeah, I like keeping them separate. Or I’d say, ‘do not read the words while looking at the picture’. A bit like the band Pulp, who would print their lyrics in the CD sleeves, but write ‘do not read the lyrics while listening to the music’. I always liked that. Salut, Pete, Ciao, comé stai? Quite talented. Check my sketch….Barely but a sketch nonetheless….I like your involvement…bye now.